His comments came after the DGA earlier set up a political action committee that raised $50,000 for Davis’ bid, and after a Public Policy Polling survey that showed Republican Attorney General Greg Abbott still has a double-digit lead on the Fort Worth Democrat. Davis’ camp has questioned the poll and slapped back at Shumlin’s remarks in a statement by campaign manager Karin Johanson. “The uninformed opinions of a Washington, D.C., desk jockey who’s never stepped foot in Texas couldn’t be less relevant to what’s actually happening on the ground,” Johanson said. “The Davis campaign is constructing an operation never before seen in Texas that’s built on the hard work of 15,000 volunteers who knocked on more than 55,000 doors in one weekend, more than 120,000 individual donors and a candidate who is exciting voters in a way not seen since Ann Richards’ come from behind victory,” Johanson said. To be fair to the DGA, the six states cited were all carried by President Obama twice, they all feature Republican incumbents who are trailing or leading by modest amounts in the polls, and in the case of Wisconsin it’s the opportunity to cut the legs out of a potential Presidential candidate. I can’t blame them for prioritizing those races; it’s what any rational organization would do. That said, Governor Shumlin could have been a lot more artful in talking about Texas and Wendy Davis. At the very least, the words “can’t win” should never have escaped his lips. How hard is it to say something like “We’re keeping an eye on Texas. 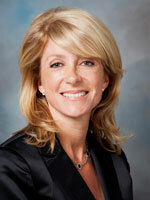 It’s a tough state for Democrats, but Wendy Davis is doing a great job. She’s inspired thousands of people all over the state to volunteer and organize for her, and they’re doing tons of work to turn Texas blue.” Pretty boilerplate stuff – it says all the right things without committing the DGA to any action. It’s especially annoying for the DGA to be saying such things while continuing to solicit funds in Texas with emails that say “Wendy Needs You”. In contrast to Democracy For American, which is calling on its members to support Leticia Van de Putte, it looks even worse. (Howard Dean and DFA already support Wendy, in case you were wondering.) I don’t don’t think it’s asking too much for the DGA to avoid being a buzzkill about Wendy Davis. Texas Leftist has more. And yet these very same Democratic organizations have no compunctions about asking me to support out-of-state candidates. Perhaps I would do better to keep all my donations at home. Just so you know, Gary, that’s what Battleground Texas is. It’s an elaborate scheme to funnel Texas money into Ready for Hillary. Same tune, new lyrics.